We need 5,000 sheets if this paper so how many would I order? It says the pack size is 50 so that makes me think I need to order 100 packs, but the quantity box doesn't specify if it's for sheets or packs of 50. Please advise, thanks! Sorry for delay! Please talk to our customer service line 1-800-8010-JAM for specific inquiries. Bringing a baby into this world is one of the best experiences. And announcing this excitement is just as fun! At least now, it'll be less stressful with this paper and cover. Making it known whether it’s a girl or boy is a big deal for all of the family so use this paper and cover to give the biggest hint there is. But this isn’t just for the babies! Bring that smooth, sweet look to any kind of occasion and make everyone excited for the event. The pastel colors will look great with an Easter flyer! Or let your resume stand out from the rest. Bring this paper in to your next interview and everyone will see how professional you are but also how confident you are as an employee. Any way you spin it, this baby pink and blue paper will impress! 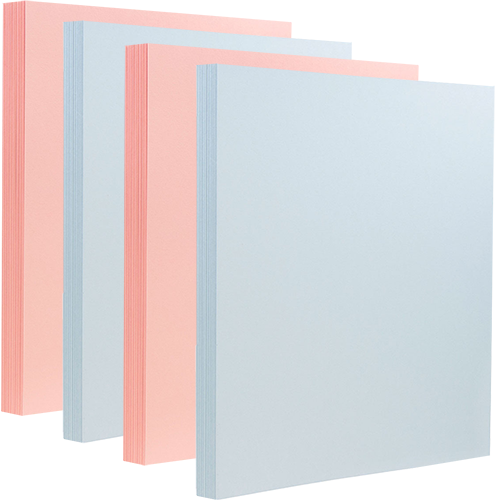 Baby Blue and Baby Pink Paper comes in 8.5 x 11 and 8.5 x 14 in 28 lb. Baby Blue and Baby Pink Cover comes in 8.5 x 11 and 8.5 x 14 in 80 lb. All packs come in 50 Sheets.